Home / acer / acer leap ware / launching / smartwatch / An elegant approach to fitness with the Acer Leap Ware. An elegant approach to fitness with the Acer Leap Ware. 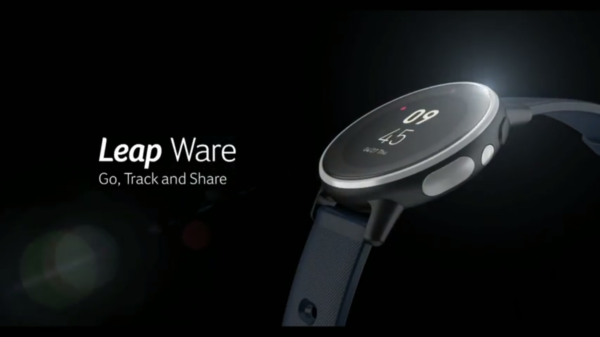 LAcer also announced its Leap Ware smart fitness watch at the next@acer global press conference in New York. This sleek smartwatch expands the company’s range of smart devices that integrates seamlessly into daily lives, it allows the user to manage personal fitness goals and stay connected to friends and family. The new Acer Leap Ware is designed to act as a virtual coach to help people go, track, and share, sending them reminders and alerts when they need them the most. Acer’s Leap Ware smartwatch features a polished stainless steel circular frame with a simple and minimalistic design. It is suited for daily usage and allows the user to benefit from a rich suite of wellness and fitness features. Its powered by MediaTek MT2523 chipset and MT2511 bio-sensing chip, the Leap Ware smartwatch has diverse fitness tracking features thanks to an array of sensors with advanced algorithms.It can monitor heart rate, stamina, stress/fatigue levels, and exposure to ultraviolet rays. It also boasts three to five days of battery life. Leap Ware’s 42-mm (1.6-inch) face features with Corning®Gorilla®Glass SR+ which delivers superior scratch resistance with the legendary toughness, optical clarity and touch sensitivity of Gorilla Glass. This smartwatch is designed with durability in mind. Corning® Gorilla® Glass SR+ is the optimal cover material for the Leap Ware smartwatch, to withstand the rigorous demands of today’s wearable devices, Gorilla Glass SR+ significantly reduces visible scratches while maintaining the superior damage resistance consumers have come to expect from Gorilla Glass. Acer Leap Ware has an IPX7 water resistance rating and can survive an unexpected torrential downpour. Also included is a built-in LED light which illuminates at the press of a button. The Leap Ware’s bands are interchangeable and comes in Navy Blue or Light Brown.But being compatible with any 20-mm (0.7-inch) watch band the user can further customize the device to add even more personal flair. Acer’s Leap Ware smartwatch can be paired with an Android or iOS smartphone via the Liquid Life™ app. Users can see who is calling or texting, and use the phone’s large touchscreen as a dashboard for analyzing all of the data collected by the Leap Ware’s advanced sensors. The app lets users set daily fitness goals with notifications to coach them, so they can stay motivated and on track. In addition, all exercise sessions are recorded in the app and a friendly avatar gives users a snapshot of how they’re progressing towards pre-set goals. The Acer Leap Ware will be available in US starting July at $139 and in Taiwan in August with prices starting at NT$4,990. The main problem today is, theres a ton of different smartwatch in the market. Will the Acer Leap Wear compete with them. To find out more about Acer new products, visit www.acer.com.